Our Road Broomer machine is an excellent solution for cleaning the dust and filth from the road on which work is supposed to be done. It has high potential, high pressure air blower which helps in brooming the road in a short period of time effectively and efficiently. Hence this machine saves a lot of manual work, time and as well as bitumen. This machine is also known as Road Cleaning Machine. We are the leading Road Broomer machine manufacturer of India and have a great expertise in the manufacturing as well as supplying high quality, excellently performing collection of Road Cleaning Machines. Our machines are manufactured from high quality raw materials with the utilization of the most up-to-date technologies. Our machines are ideal for swift and competent cleaning. This user-friendly machine range has hassle-free operations and is long-lasting. Our machines are chiefly employed in the cleaning operations on the surface of the roads prior to the application of tack coat or before laying a new Hot Mix Asphalt. These machines are also suitable for cleaning roads that already exists. 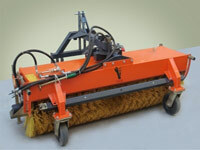 Additionally they are also utilized for cleaning Road, Street, Highway, Petrol Pump, Parking Plot, etc. Rapid & speedy over a large area can be very time saving than the manual cleaning of the road. We engineer this equipment is precisely and offer a rotating brush which automatically cleans the dusts from the roads completely with minimum time. 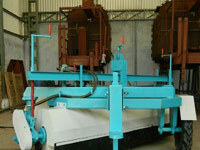 We also tailor-make these machines, as per the specifications of our clients. This zero maintenance machine is acknowledged by the traders & clients of the national as well as international market for their high competence. 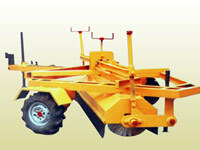 Has a width of 2.5 m.
Easy transportation of this machine possible simply by attaching it to the rear of a tractor. Chassis as well as linkage holder are completely made up of steel. Mechanical or hydraulic driven wheels on the Broomer. Screws help in the adjustment of the pressure of the brush. Clear visibility to the operator with the help of anti-dust guards. Sweeping Speed 7 to 15 km/hr.